The busy season is coming and the best way to keep track of all your new employees is the Employee Chart! This simple template makes entering and storing important information easy and fast. The Employee Chart is set up as a checklist for all the items associated with a new employee: background check, legal documents, contracts, and everything else your organization will require. Don’t lose sight of a single document this year with this template! Begin by downloading the file below. After you have successfully downloaded the template you can begin editing the document to fit your organization’s hiring requirements. This template takes all away all the guesswork and the learning curve associated with most new employee documents and gives you an efficient checklist to mark the items you’ve already covered. On the left-hand side is a list of documents that are common for employers to verify a new employee’s identity. Simply go through this list and change or add any item that your organization requires. With your list all set up, you can print the document! Click the “File” tab in the top-left corner of the page and select “Print”. 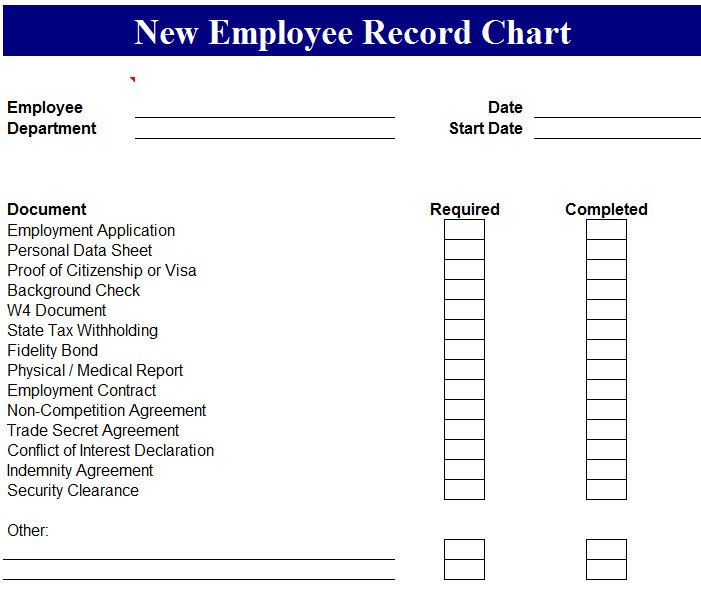 You can also enter the information for each new employee on the computer and keep everything digital. When you’re ready to go through the list just mark any item that is needed by your organization in the “Required” column. After you have filled out this section, simply mark any documentation that has been reviewed by you. This way, you’ll be able to verify the information has been completed.